P0507 – Idle control fault. P2279 – Leak in the air intake system. In this fault, constant oil leaks are identified at the rear of the engine and in the spark plug locations. It is possible that fuel may be found in the spark plug area due to a loosening of the cylinder head bolts as a result of excessive pressure in the lubrication circuit. The valve intended to retain the crankcase vapours (PCV), that is joined to the cylinder head cover does not function correctly, specifically the internal membrane of the non-return valve. This PCV internal fault allows the turbo pressure to enter the oil vapour circuit. 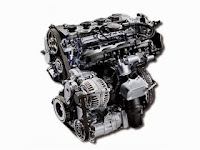 The model of the crankcase oil vapour purge valve must be checked and the metal hose doser that runs from the turbocharger to the intake manifold. 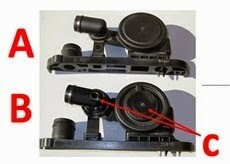 There are specific spares for these two parts to solve this fault. Section affected of the hose that runs from the turbo to the intake manifold. View of the affected PCV modules. 1 - First, check for the existence of oil leaks at the rear of the engine as indicated at the beginning of this newsletter. 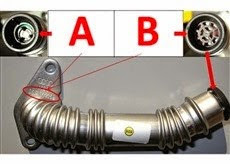 2 - Check the existence of fuel or oil from the engine's lubrication circuit in the spark plug area. 3 - Check the condition of the cylinder head bolts and retighten them to 10 Nm if necessary. 4 - Check the PCV model. 5 - Check the doser of the hose joined to the turbo and the intake manifold. · For all models: 06F129101E, 06F129101F, 06F129101K, 06F129101L, 06F129101N. · The reference of the modified PCV model: 06F129101P. · For all models: 06F103215A, 06F103213N, 06D103215A, 06D103213G. · The part reference of the modified turbo hose model: 06F103215B or 06D103215A. Note: The tightening of the new crankcase vapour recirculation valve (PCV) should be 4 Nm, and the coupling of the new hose to the turbo should be 9 Nm.